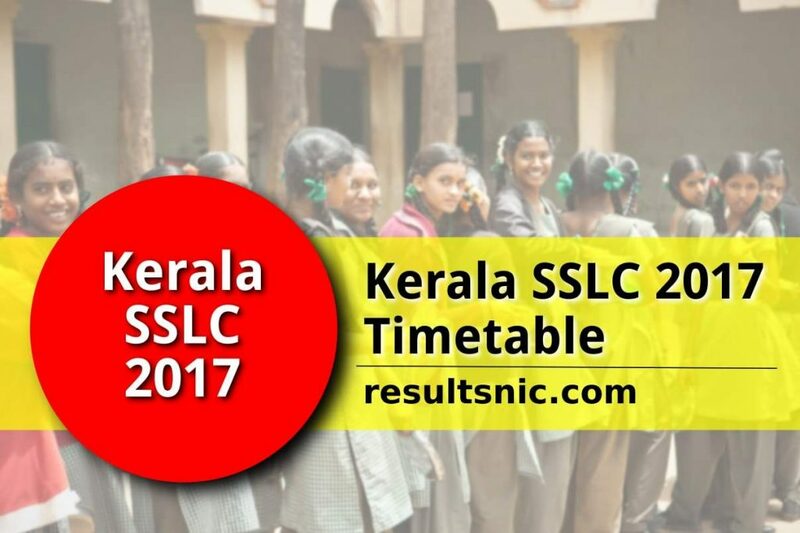 Kerala SSLC Examination 2017 Timetable is given below. This timetable is described on the notification from the Examination Commissioner, Govt of Kerala. In the notification more details about Kerala SSLC 2017 are also available. The grading system, SSLC grade points, details about theory and practical examinations, SSLC application forms etc. SSLC Regular Examination consists of 9 subjects with written examination and continuous evaluation. Mark ratio of English, Mathematics, Social Science Written examination, Continuous evaluation is 80:20 and in the case of Information Technology it is 40:10. In Information Technology the total score of examination is 50 instead of 40. Theory and practical examination is on Computer. The ratio of Information Technology examination with Continuous evaluation, Theory examination, Practical examination is 10:10:30. The written examination duration of subjects with 80 score is 2 hours 30 minutes. Duration of subjects with 40 score is 1 hour and 30 minutes. On SSLC certificate there is only grade. Grade point scale is 9 point scale. Kerala SSLC Grading scale is given below. SSLC grade is as per this scale. The point value is calculated from written examination, continuous evaluation and practical examination for various subjects. The duration and total points of the subjects are given below. There are two schemes for time duration. One is 50 score subjects with 1hour 30 minutes examination and second is 100 score with 2 hours 30 minutes examination. For information technology examination the duration is 1 hour with score of 50. For getting the eligibility of higher education a candidate must a D+ grade overall. The grade is calculated by adding the scores of Continuous Evaluation, Terminal Evaluation and Theory / Practical examination of Information technology. The minimum score come in between 30% to 39%. Students who are getting a grade of D+ can apply for SSLC SAY 2017 Examination. Students must apply for SAY Examination within 5 days from the declaration date of Kerala SSLC Results 2017. There will be a special notification regarding Kerala SSLC SAY Examination 2017. Last date of submission of Fees including all the details with all fine is 29th November 2016. The original bank receipt, application forms, certificates are available at schools for further reference. The first 15 minutes of the examination is cool of time. At this time all students in the examination hall must not allowed writing anything on the answer sheet or question paper. Thanks for complete timetable. Preparing for SSLC. Need Previous Year Question Papers.